Shane Soh and Eileen Liu, students at Cornell University, designed this acoustic wayfinding device to assist visually impaired persons with navigation. It uses two ultrasonic range finders; one is head-mounted navigation system and the other is a wearable tactile sensor unit plugged on to the user’s finger. The two systems work together to sense the surrounding physical space and instructs the user to turn left or right to avoid the obstacles detected in the field of view. 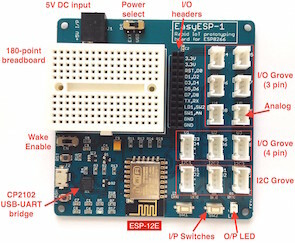 The project uses ATmega1284 as the main controller and three MaxBotix MB1000 units as sonar rangefinders. The head-mounted navigation system consists of two ultrasonic rangefinders and two vibrating motor discs. The rangefinders are capable of detecting obstacles up to 6.45 meters away with a field of view of about 120 degrees. The head-mounted system instructs the user to turn left or right using one of the two motors mounted on the back of the user’s head. 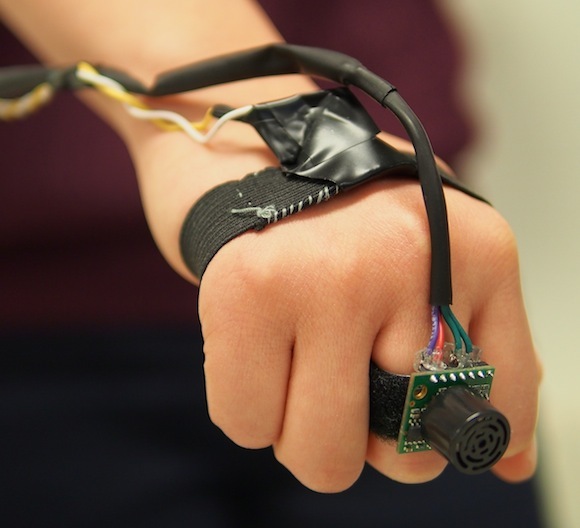 The hand-mounted tactile sensor consists of one ultrasonic rangefinder and one motor that the user can wear on his or her hand. The tactile sensor allows the user to “scan” for obstacles below eye-level (typically out of the range of the head-mounted sensors) by sweeping his or her hand laterally, similar to how one would use an assistive cane. The rate at which the motors pulse is proportional to the distance of the obstacle from the user – the closer the object, the more rapid the pulses.